The Bush Administration along with a majority of the mainstream media have been engaged in an escalating campaign to demonize Iran and its people in an eerily familiar campaign to prepare public opinion for yet another possible military intervention. 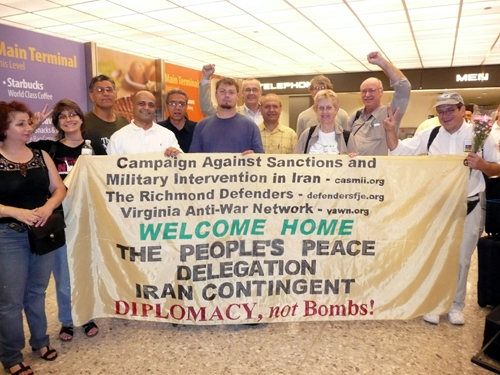 In response, the Virginia Anti-War Network (VAWN) and the Richmond Defender newspaper organized a People's Peace Delegation to Iran in response to a suggestion by the Campaign Against Sanctions & Military Intervention in Iran (CASMII). Delegation members consist of anti-war activists, war veterans, and environmentalists from Richmond VA, Norfolk VA, Washington DC, and Milwaukee WI representing various local, regional and national social justice and anti-war organizations. The trip was financed by the member's personal funds, sponsoring organizations, and through public fundraising events. The five-member delegation was greeted by CASMII associates in the DC area upon their return at 8:00 P.M. on Monday night of July 30, 2007. They will present a report on their 12-day, 1,750-kilometer journey through Iran during a scheduled 10:00 A.M. Press Conference on Tuesday July 31, 2007 at Busboys and Poets Restaurant located at 2021 14th Street NW, Washington, DC 20009 in the Langston Room.